Do you struggle to get through a video conference without interruption and distraction? 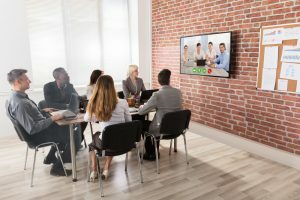 Inefficient meetings can greatly impede your team’s productivity level, which is why it’s important to have ways to keep your video conference on schedule and on topic. If you don’t have a proper agenda that itemizes each topic or issue, people won’t know what is expected and will likely derail your meetings. You can nip derailment in the bud by outlining the purpose of the meeting and sending meeting notes ahead of time. That way, if anyone disagrees with the topics or wants to add something to the agenda, they can approach you before hand. It’s not uncommon for meetings to go off track when people bounce from one topic to another without any flow. Avoid this from happening by letting everyone know you will get to each topic only once you have closed off the current one. If someone isn’t ready to move on, find out why and then schedule a time to discuss the subject with them at a separate time, or set up another meeting focused on this topic to keep the meeting moving swiftly. Even if people are missing at the start time, go ahead without them. Don’t let people hold you back. Let them fall behind when they’re late and catch up afterwards on their own time. This will teach them to always show up on time and that the meeting doesn’t wait for them. You should also keep to your timing. If you consistently run over the allotted timeframe, people will feel as if you’re wasting their valuable time. If you have to schedule another meeting to stay on time, do so. If your video conference is scheduled for a full hour, it’s unlikely you’ll keep everyone engaged the entire time — they’ll start checking their phones, stare out the window, or even leave when they get bored. It’s also difficult to keep everyone on subject with that much time. Try to keep meetings short, between 15-30 minutes to keep everyone focused on accomplishing what needs to be done. In a perfect world, managers inform their assistants about the key-takeaway points in their meetings. Unfortunately, this is rarely the case. If you want the main topics of your video conference to be noted and addressed, you need to invite your assistants along. They will take notes and ensure follow up, which will guarantee that all the crucial takeaway points get addressed. Allowing people to sit at their desk to participate in the video conference is a recipe for disaster. They will only get distracted, so it’s important to host the meeting in the right setting. If you don’t have a well-equipped boardroom that is quiet or offers privacy, you should rent out a meeting space. The right setting will keep everyone focused and on schedule and topic. When you need an off-site location for your meetings and video conferences, schedule a room at the St. Elias Centre. We have everything you need – from video conferencing equipment, A/V equipment, flexible meeting space, and even on-site catering! Contact us today to learn more about our facility and services.